The stackt MARKET is a unique, ever-changing and curated retail experience made up of like-minded local, national and international residents each providing new ways to shop, connect, and discover. Satisfy your sweet tooth with delicious new flavours from this new bubble tea place! The Belgian Moon Brewery is a first-of-its-kind, state-of-the-art, premium small batch brewery built inside of three shipping containers, stunningly imagined, designed, and executed as the beer itself. BMO has been serving customers for over 200 years to over 7 million customers. With over 900 branches and our new intuitive ATMs, we’re always right around the corner. A multidisciplinary home décor design studio collaborating with emerging Canadian designers. Their first retail space features new designs with the 2019 collection. Donut Monster creates an ever evolving menu of unique from­ scratch donuts made fresh daily with high quality ingredients. Vegan & traditional options offered. Dresden is a new concept in prescription glasses: simple, affordable and sustainable. Ultra-durable frames with top notch lenses: 1 shape, 4 sizes, a riot of colours. Ellie Mae is a premium womenswear line specializing in unique vintage-inspired pieces that tell a story of individualistic style. We also house some of north Americas most sought after vintage tees. Endy’s mission? To help all Canadians get a better night’s sleep. Try the brand’s award-winning mattress and innovative sleep products in a warm, cosy, Canadian lodge. FILMARTIST is a creative agency dedicated to helping brands explore the intersection of art, design, and technology to fuel awareness and drive engagement. Enhanced with the essence of organic flavour, Flow hydrates with an uplifting and refreshing taste. Inspired by a vibrant made-to-match selection of Pantone colour-ways, House of Hayla's monochromatic collection of women's accessories combines the perfect mix of vegan materials in single tones to create unified looks that compliment any outfit. Choose from tattoos for now, or forever. inkbox tattoos are painless and last 1-2 weeks. Or, experience the path to permanence with on-site tattoo artists. JL Design gallery is a pop up shop showcasing a collection of hand picked, graphic art prints from around the world, printed & produced in Toronto. The gallery champions design and displays noteworthy prints & furniture from selected local artists. We stay true to our motto, "It begins with ideas. Then we make them concrete." We hand-make our concrete goods and teach you how to make your own in our workshops! Keep and eye out on the events page to sign up for our workshops! Poco Mono is Canada’s newest eco-friendly, 100 percent certified organic children’s clothing line. Reunion Coffee Roasters is about creating great coffee experiences while doing good in the world. At stackt, that means a beautiful café, serving sustainably-sourced and award-winning coffees. At Richface, you’ll find personally prescribed face treatments and a deeper truth about what really works. We get under your skin… and you’ll love us for it! Startup HERE Toronto is a platform dedicated to sharing entrepreneurial news, activities & profiles of new Toronto-based companies. Showcasing retail and creative entrepreneurs will be startGBC, the Remix Project & Business in the Streets. Born in St Barths, crafted in Brazil, and worn globally, TKEES sandals are designed to compliment your life. TKEES is where everyday meets elevated. Welcome to YamChops, North America's first plant - based butcher shop! Vegan, vegetarian or flexitarian... Come try us out and lose your "Veginity"! It takes a community to build a community. Thankfully, stackt has a number of partners that have helped us achieve just that. LGA is a skilled team of architects and building scientists, based out of Toronto and Edmonton, who create contextually-sensitive and civic minded architecture. STACKLAB is an award-winning art-and-design studio experimenting with materials and fabrication techniques while pursuing critical approaches to form and use. Business in the Streets helps young, low-resourced, emerging entrepreneurs succeed by providing access to training, mentorship, funding, and ongoing supports. SCCC will facilitate community gardening opportunities in a state-of-the-art passive solar greenhouse to promote urban agriculture and sustainable food systems. ====\\DeRAIL commissions place-specific and socially-engaged art projects to foster new conversations about public space design and contemporary city building. SUH Toronto celebrates Toronto's innovation community by connecting entrepreneurs to programs, resources & events to help start, grow & scale their businesses. startGBC is a virtual hub connecting students, alumni & community with resources, programs & support to foster a culture of entrepreneurship on campus & beyond. Remix Social Enterprise provides income solutions to grads of Remix Project, supports their entrepreneurship endeavours & raises funds for the growth of Remix. A network of creative place-makers that connect the public to urban environments in positive ways. The STEPS Initiative is an award winning public art charity that bridges culture, community, and city-building by animating spaces with unlikely partners. FCR is focused on enhancing communities and creating connections within neighbourhoods. FCR is building connections to stackt through unique art elements. 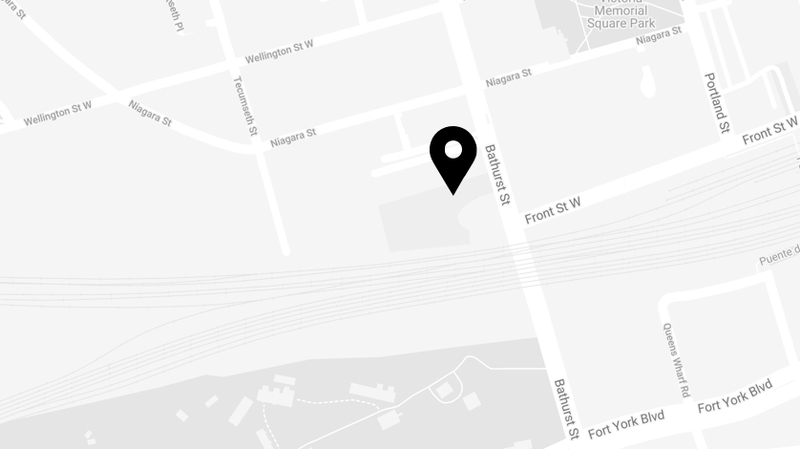 Toronto local, Beanfield owns & operates the largest private fibre-optic network in the city providing connectivity to stackt vendors & FREE WiFi to visitors.